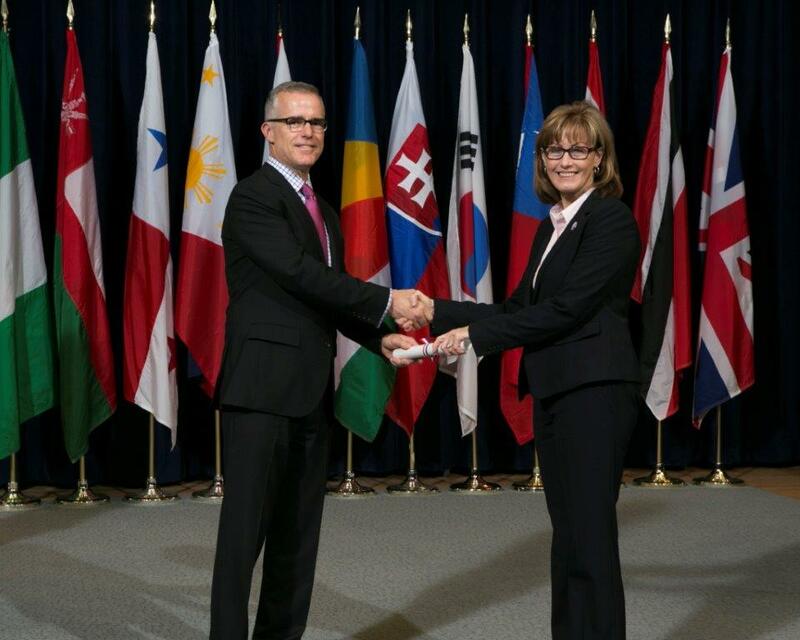 Detective Lieutenant Vicki Arnold of the Morristown Police Department recently graduated from the 263rd Session of the FBI National Academy Program. The National Academy Program is held at the FBI Academy in Quantico, Virginia. Lieutenant Arnold is the sixth National Academy graduate from the current command staff of the Morristown Police Department. Lieutenant Arnold’s class consisted of 230 law enforcement officers. The 230 men and women represented 47 states including law enforcement agencies from the District of Columbia, 27 international countries, 4 military organizations, and 5 federal civilian organizations. The FBI National Academy Program was established in July 1935. It is internationally known for its academic excellence. The program is 10 weeks of advanced investigative management and fitness training for selected officers. In order to be selected, officers must have proven records as professionals in their agencies. The average selected officer has 19 years of law enforcement experience and usually returns from the academy to serve in executive-level positions. “I am honored to have represented the Morristown Police Department at the Federal Bureau of Investigation National Law Enforcement Academy. I truly appreciate my family and fellow officers for the support they showed during this time,” Arnold stated. Lieutenant Arnold has served with the Morristown Police Department since August 1988. While on patrol, Arnold worked in the school system, as a School Resource Officer, teaching D.A.R.E. and G.R.E.A.T. Currently, she serves as second in command for the Criminal Investigations unit, helping to conduct Internal Affairs and background investigations. She is responsible for assisting in the administrative tasks of the division, including case assignments, case tracking, supervision of detectives, and planning and scheduling. In addition to her regular duties, Lieutenant Arnold is the department’s Juvenile Officer and conducts training for MPD employees on Amber Alert and Child Abuse. She is also a member of the Internet Crimes Against Children Unit, Homicide Team and Child Abuse Sexual Exploitation Unit. Arnold holds both a Masters and Bachelors of Science Degree in Criminal Justice from Bethel University. In addition to the FBI National Law Enforcement Academy, Arnold is a graduate of the Federal Bureau of Investigation’s Tennessee Law Enforcement Executive Development training program. The current MPD members who are National Academy graduates are: Chief Roger Overholt, Major Chris Wisecarver, Detective Captain Christian Newman, Detective Lieutenant Vicki Arnold, Captain Mike Giles, and Lieutenant Billy Gulley.